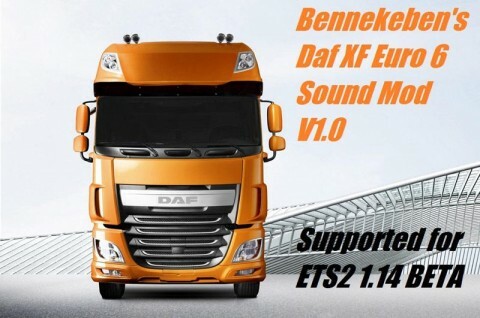 Mod adds improved sound truck DAF XF Euro 6 for Euro Truck Simulator 2. With the release of the new patch 1.14 was born popular truck DAF Euro 6, which currently has a host of new game features, including lifting one axle chassis. The creators of the modifications do not sit on the ground and there were first mod for new items that will add enhanced sound. Everything is done very efficiently, errors and bugs in the present. Most of all I liked the sound of the truck during acceleration, when the engine starts to growl. The mod has only been tested on version 1.14.